Today, I am a quilt factory! Been so busy I havent even had time to do a proper post, but I'm about half way through a new log cabin quilt. Woot! 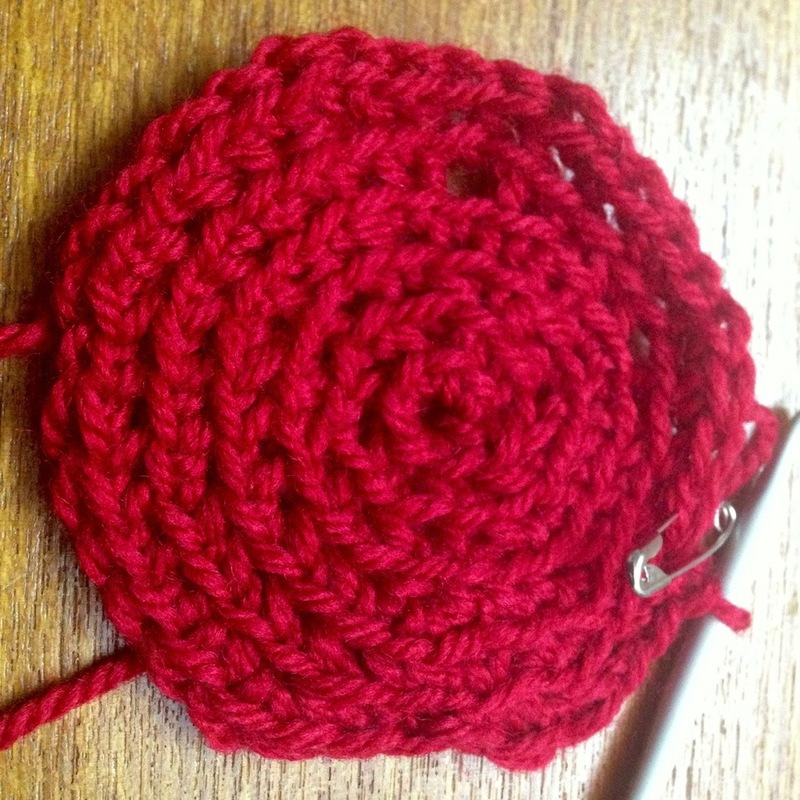 After my recent introduction class at The Make Lounge, I had been struggling a bit trying to get to grips with crochet on my own. 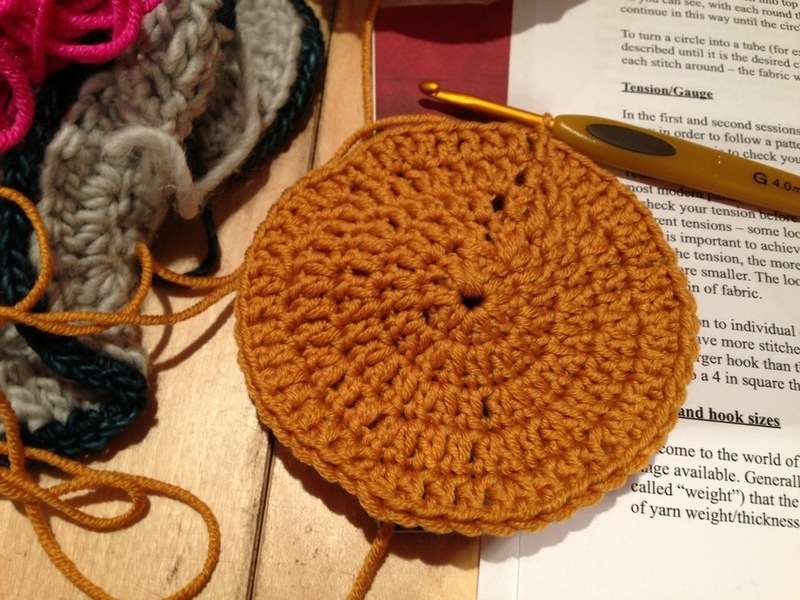 I looked around for some classes which were a bit more in-depth, and while shopping for crochet supplies, I found a 3-class Beginners Crochet course at Loop in Islington. I was lucky to nap the last spot in a class starting on the 19th February. Loop is a lovely little knitting & crochet shop in Camden Passage - the sort of place that is lethal for your wallet. The staff there are really sweet and helpful, and though they don't have the largest stock of wool in the world, they have a beautifully curated selection. The classes at Loop are held in the basement where they have a nice room which comfortably seated the six students and our teacher Jemima. For our first class we learned the basics - making a slip stitch, holding the yarn, creating a foundation chain, and how to do double crochet and treble crochet stitches. We also did turning chains, and spent most of the class just trying to do neat, even rows of stitches. Not that simple when your left hand doesn't want to comply, and you're not used to counting stitches. 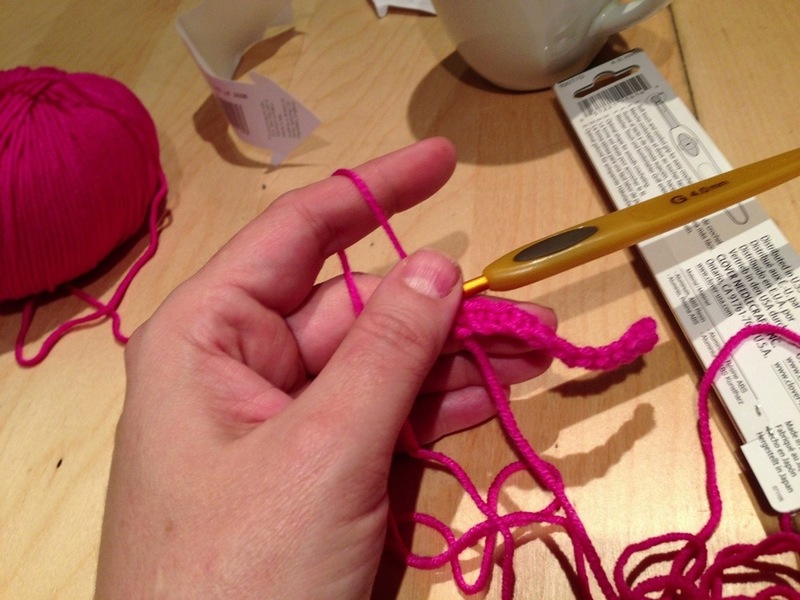 The great thing about crochet is that it's pretty easy to pull out the stitches if you make a mistake! And luckily there was plenty of tea and biscuits available for sustenance. At the end of the first class Jemima told us to practice, practice, practice. She promised that it would get easier. I took it pretty seriously and I practiced for at least half an hour every day, just randomly stitches rows of different types of stitches. And suddenly, my left hand seemed to know what I wanted it to do, and holding the hook started to feel more natural. Yippee! 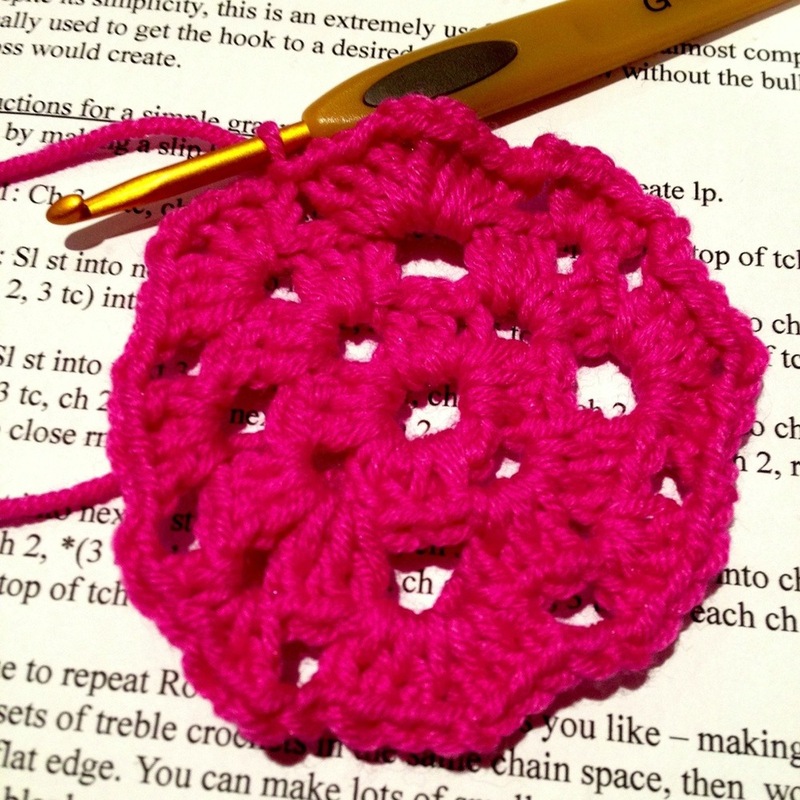 A week later at our second class, we learned about increasing and decreasing stitches, doing slip stitches, and we started making a simple granny square. This was also our introduction to following crochet patterns, which at first seem to be a boggle of obscure abbreviations. Making a granny is really satisfying as you end up with something which looks complete in a relatively short period of time - it's easy to see why they are an enduring crochet favourite. By the end of the second class, I was feeling bold and decided to try a simple project of my own at home. I picked a simple narrow spiral scarf design that I found in a magazine, and managed to complete it in a couple of nights in front of the telly. Progress at last! granny square that I'd started at home to finish. We also learned how to work in a circle, talked a bit about tension, hook sizes, making swatches and how to read a crochet chart. Charts are awesome - one of the books I bought has them and they are genius for demystifying written pattern instructions. Apparently the use of charts for crochet is fairly new, and you need some heavy-duty software (like Illustrator) to create them. Hopefully some bright spark will devise a free/cheap app to create them soon, because I do find them dead useful. All five of the other ladies in the class seemed to enjoy it as much as I did, and we encouraged Jemima to run an "Improver's Crochet" class where we could build our skills. I have already started a simple project from a book by Erika Knight called Crochet Workshop, as well as working on more granny squares, and planning my next six projects. I've also joined Ravelry, which is a great social networking site for knitters and crocheters - you can keep notebooks for your stash, patterns, projects etc, and check out lots of patterns (including loads of free ones), and see what other people are making. I can see that buying wool could easily become as addictive as buying embroidery threads! And I'm really loving doing the crochet, so how I'm going to fit all my embroidery, crochet, sewing, cross-stitch, quilting etc into my precious spare time is going to be a bit of a problem........ ! Plus finding the time to write blog posts about it? I'm going to have to give up the day job, it's clear. I'm doing well on my at least one front with my resolutions for the year. I promised myself that I would learn some new skills, or improve on some of the ones I have. After last year, which was spent mostly being stressed about work, or stressed about being sick... it's time to invest in the positive! Last Thursday I went to my first class at The Make Lounge in Islington here in London. I say "first class" because I can spoil the surprise and tell you that I will definitely be going back for more. Lucky for the universe, there are a few great places like The Make Lounge popping up everywhere - spaces for learning and and doing crafts, buying supplies etc. Or as The Make Lounge says "meet people, make stuff". The space is split into two bright rooms divided by a windowed wall, and there was a chocolate making class in the other side that night. We were greeted by a super sweet workshop assistant who instantly made everyone feel comfortable, given tea, coffee, wine and snacks. I wish I had taken more photos of The Make Lounge but I was too dazzled by their displays of threads and fabric and embroidery threads to get out my camera. The 'Learn To Crochet' class was taught by American ex-pat crafty lady Catherine Hirst, who was a few minutes late due to London Dead Bus Syndrome, but soon had us making slipknots and trying to train our non-dominant hands to hold contorted positions in order to create tension with our crochet cotton. Catherine was a wonderful teacher, obviously very skilled both at the craft of crochet and at leading workshops. (At one point she revealed she had a trophy for 'fastest crochet' which she won when she was 17, making her a total boy-magnet, not. Lol.) We were taught to create foundation chains, turn our work, and do the UK version of double and treble crochet. Once we had grasped those basics, we moved on to a simple flower pattern. The class was ten people - a good size to be fun and social but small enough to allow the instructor to help each of us individually throughout the evening. My only criticism of the night was that it proved to be quite ambitious to cram all the learning into 3 hours. Towards the end it became a bit of a race and I felt a wee bit stressed trying to finish my flower. I am so happy to have done the class and I have practiced dutifully every night since, using Catherine's awesome collection of tutorial videos for support. Of course I now want to run out and buy 50 balls of amazing wool. But I'm going to exercise some self-control and just keep practicing with my one ball of red for now.